My “powder of the moment”, both for everyday use and when I’m going to be on camera. It’s an absolutely invisible and weightless setting powder that seems to literally freeze time: over the course of a twelve hour rush about town last week, my makeup stayed exactly the same as it had been when I left the house. I was very impressed. Prior to this setting powder, I was using the Smashbox Photo Set Finishing Powder, but I think that this one from Vichy might just pip it to the post in terms of longevity. The Dermablend Setting Powder doesn’t seem to settle into any fine lines or creases and it does a brilliant job of keeping everything in place, especially if you tend to suffer from a bit of makeup slippage in the T-Zone area. What I have noticed, though, is that it’s not so efficient at blotting up oil and taking away shininess – it’s more of an initial set. So I do my makeup and then I dust my whole face with the Dermablend powder – even my eyeshadow if I have it on – and then I screw the lid back on and leave the pot at home. I take a different powder out with me for mattifying and toning down shiny areas of skin and it (so far) appears to be a perfect little system. 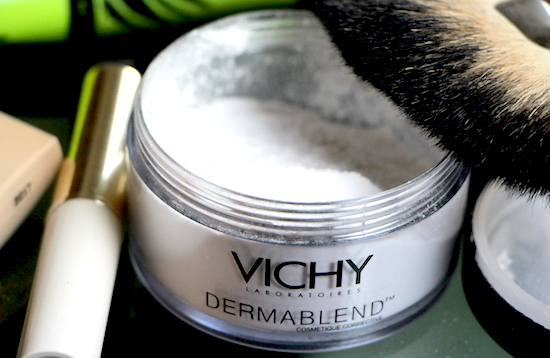 I don’t consider the Vichy Dermablend to be a powder that you blot with; it’s a fixer that happens to be in powder form. You could take it out with you, of course, and reapply, but I have more portable and convenient powders for that. Note: during the course of my twelve hour manic rush about town, it drizzled quite a bit. (Funny that, in England!) My makeup survived what ended up being a proper dampening – normally I’d have to do some kind of reapplication, but a quick check in the loos at Debenhams on Oxford Street (better than John Lewis, never a queue) revealed, to my delight, that all foundation and concealer and even my bronzer were still in tact. I apply the Dermablend Setting Powder using a large fan brush (Japonesque) or, if I’m being lazy and I want to use the same brush for everything, the Real Techniques Dual Fibre one. You have to make sure that you pick up just the tiniest amount and then knock the brush handle against the edge of the table or desk or what have you to tap the excess off. It’s all about light-handed application – dusting on a virtual veil of invisible powder. It’s a bit like a raincoat for your face, I suppose, except that you can’t feel the powder at all. There’s no tightness or dryness, though I’m sure you’d get some if you were too heavy-handed. You can find the setting powder at Escentual.com here – it’s £13.60. Has anyone else tried this? Let me know what you think! Previous Post The Brit Awards with VO5: Crimping, Spanx and Celebrity Hair. Next Post How to Wear Pastels? With some Grumpy Animal!